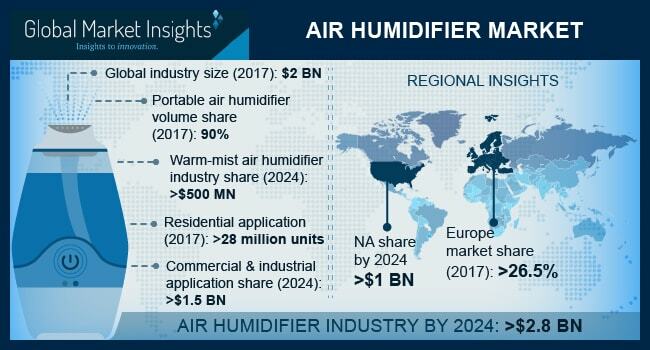 Air Humidifier Market size is estimated to surpass USD 2.8 billion by 2024; according to a new research report by Global Market Insights, Inc. Proliferating disposable income along with increasing living standards are the key factors for air humidifier market growth. Improving comfort level requirement in residential segment will improve the product penetration. The industry is projected to experience high demands during winter season particularly from colder geographical region owing to increased chapped lips & skin, sinus passages sore eyes, dry throat, and sinus congestion. Health awareness and changing weather conditions will drive commercial and residential air humidifier market size. In addition, these devices are anticipated to reduce the risk of respiratory illnesses and are directly proportional to the level of comfort perceived by customers. Superior office atmosphere and sanitization offered by these systems will positively impact air humidifier market size. Commercial & industrial air humidifier market is estimated to exceed USD 1.5 billion by 2024. Swift adoption of these devices in numerous sectors such as manufacturing, hospitals, operation theaters and process data centers is anticipated to justify growth prospects till 2024. Residential sector accounted for over 87% of the overall air humidifier market volume share in 2017 and is forecast to continue its dominance from 2018 to 2024. Optimized energy consumption along with low operational cost in advanced systems are likely to increase its demand from various sectors including industry and process data centers, hospitals and operation theatres. In addition, simplified installation and ease of usability is projected to drive the product demand, over the next seven years. Dry atmospheric conditions lead to interference in efficient operation of production equipment and other electronic machines. Air humidifier market is anticipated to witness substantial demand from explosive sectors, as dry air and its resultant static electricity accumulations may prove extremely hazardous. Air humidifiers are installed in healthcare buildings to maintain optimum level of humidity offering prevention from dryness and respiratory illness among individuals. In addition, these are installed in industries such as cold storages, printers and paper manufacturers to prevent dryness, paper curl and shrinkage. High maintenance and health concerns may hinder air humidifier market growth from 2018 to 2024. Humidifiers might lead to household mold growth due to mildew on ceilings, walls and upholstery. Molds lead to health issues due to breeding of unhealthy organisms including bacteria, germs and fungi. Costly spares such as mat, water tank, tray and filters may pose further challenge. However, introduction of centralized systems with low maintenance and operational cost along with ultrasonic humidifiers using distilled water will overcome these challenges. Portable air humidifier market share accounted over 90% volume in 2017 and is forecast to continue its dominance over the forecast period. Convenience, cost competitiveness and easy installation, offered by these devices are the key factors anticipated to fuel demand over the next seven years. Warm-mist segment accounted for around 20% of the revenue share in 2017. Low maintenance and quiet operation are the key factors positively influencing the ultrasonic air humidifier market segment growth till 2024. Superior humidification and compatibility with the air duct are the key features offered by the whole-house systems. Reduced maintenance expenditure and efficient power consumption offered by the whole-house systems will drive the segment growth. North America air humidifier market will register growth at around 3% during the forecast period owing to increased consumer awareness through government and regulatory bodies such as USEPA and ASHRAE. Strong purchasing power along with cold climatic conditions in the region will propel air humidifier market growth in Europe. Asia Pacific will register rapid growth owing to increase in public spending and rising awareness among the consumers. Key participants for air humidifier market include Dristeem, Boneco, Carrier, Arnstrong International, Carel Industries. Other industry players include Winix, Nortec Humidity, Stadler Foam, P&G, Vornado, Honeywell, Philips, Neptronic. Manufacturers are adopting merger & acquisitions along with healthy investment in R&D to enhance the product portfolio to improve their market share.